Earlier this week I posted a proposed speech for President Obama, based on suggestions and comments from our members, that amazingly mirrored a speech he gave just a couple of nights later at the Congressional Hispanic Caucus. You can check out that post and the comment showing the speech here. We are so damn on the cutting edge here folks! The inspiration for writing and planning on sending him this speech was the frustration of many here that the hatred in this nation has been getting out of hand and it was high time a national leader made a high profile demand that this insanity end. Still, we were seeking a much more publicized and televised response to tamp down the flood of anger than Pres. Obama’s speech provided on Wednesday night. Little did we expect that thinking the same thing at the same time as us and stepping up to make that big public push back on the hate would be…not Obama…but Jon Stewart and Stephen Colbert!!! 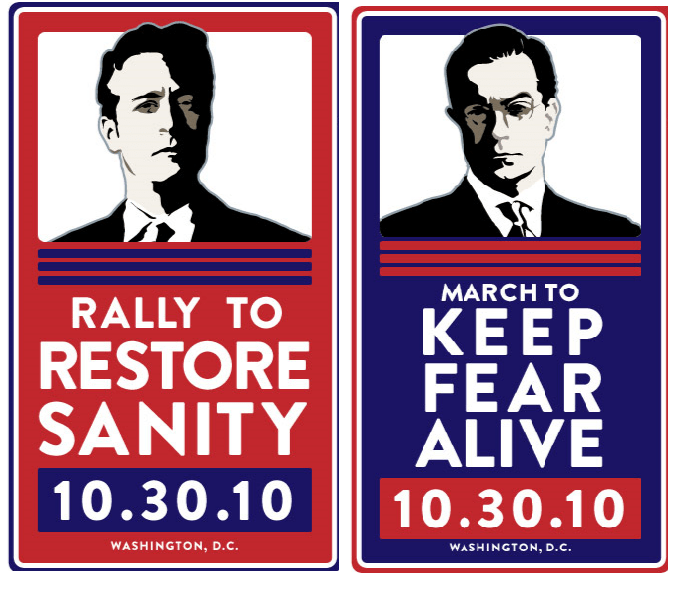 If you missed their shows last night, they announced a joint rally in DC at the Washington Mall on 10/30/2010 which Stewart is calling, “Rally to Restore Sanity” but the evil Colbert is calling, “March to Keep Fear Alive”. If well attended, might this help push back on the ongoing narrative in the MSM that the inmates are on track to run the asylum? 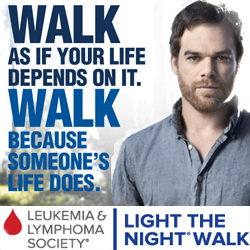 Might it be the spark that helps nudge Dems and other sane folks to get engaged and energized to vote in Nov? Who knows but it should be quite entertaining! At the very least, I hope there will be lots of people with hilariously misspelled absurdist signs! And images of Jon Stewart with a Hitler moustache and Colbert Photoshopped to look like The Joker! I won’t be able to attend but if any members here might be able to attend, please let us know and we’ll set up a post for you to provide your exclusive reports! Otherwise, take comfort in knowing that the sanity of the majority of Americans will soon be on display in DC! And using my Michelle Bachman calculator, I predict 18 trillion people will show up! I really hope this can be a counterpoint to the absolute insanity that occupies this nation. I realize that if “they” win in November, MY job is set for life since they aren’t likely to go away anytime soon, and people who are appalled by what this nation hath wrought will flock to us for some solace (presuming we aren’t rounded up and at Manzanar, not as tourists.) But I don’t want McCarthyism redux, thanks anyway. In the age of instant communication, they would do so much more damage than in the 50s, I can’t even wrap my mind around it all. I am SO appalled that Carl Paladino, surely one of the crassest, venal, and stupidest men of all time, has won the Republican nomination for governor of NY. Will that assure Cuomo? Who knows? GOTV was never EVER more important. I am about to give up hope, but I must say that this delightful rally and spoof has lifted my spirits. I just have one question -- why does the pic of Jon Stewart make him look like Lawrence O’Donnell? If Stewart ever took himself that seriously, we are all in a world of hurt. I’m seriously thinking about going to DC for this. It would be worth it! So good to see you again, c’lady! Since I fairly often end up taking care of psych patients, I think I may join you in the job security department if “they” win in November. Either the T-Bag people will be hospitalized when people actually figure them out, or “we” will be when we see what they have wrought. Like you, I’m seriously mulling the possibility of going to DC at the end of October. The problem with “us,” though, as opposed to “them,” is that so many of “us” have “real jobs with real responsibilities,” to quote the awful responsibility-shirking Ms. Palin. TeaBag people are either the comfortably retired, the very, very eccentric (who would be as comfortable pushing a shopping cart full of “stuff” down the street in DC as in any other major city and can be easily bussed from place to place by the Koch brothers), or the young and deluded (which includes children who are dragged to these events by parents who couldn’t find Klan rallies to attend that weekend). 18 Trillion? Wow. I hope they’ll have at least 300 billion Johnny-on-the-Spots set up. This very creative use of space and function means everyone in the family can enjoy their own tunes while taking a visit to room fondly known as the loo.